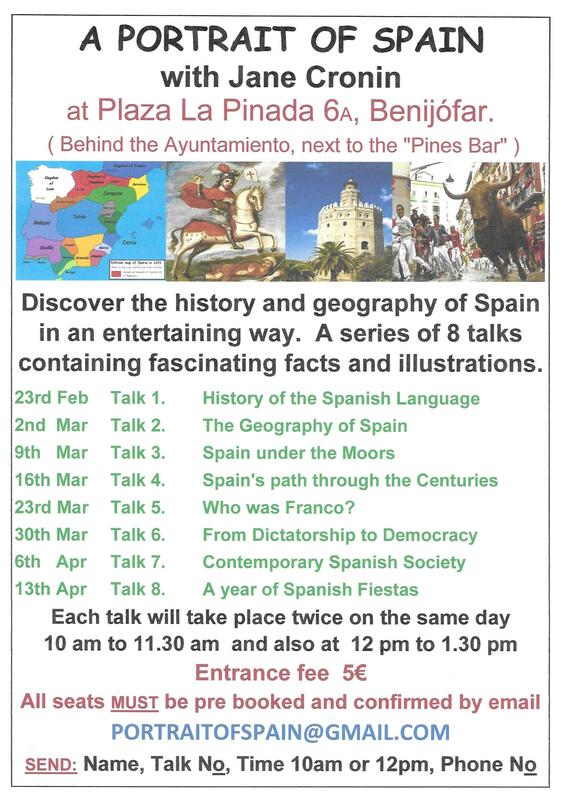 Due to increasing demand, I am delighted to announce that I will be giving my series of eight talks entitled “A Portrait of Spain” in Benijófar starting on Saturday February 23rd and concluding on Saturday April 13th. The talks are being organised in conjunction with Reme Ruiz who is a Spanish teacher at the venue in Benijófar. The talks will be delivered in English and are designed to give you a lively and interesting introduction to Spanish culture and history. They are suitable for anyone who would like to learn more about this country, whether you are a student of the Spanish language or not. Each talk will be accompanied by a colourful PowerPoint presentation and supported with printed notes. There are two opportunities to hear each talk and attendance must be booked by e-mail to: portraitofspain@gmail.com as places are limited. Your booking should include your name and names of people attending, contact telephone number, talk number and time. Attached is a poster which gives you full details of titles, dates and times. All bookings will receive a confirmation e-mail with directions to the venue. I look forward to seeing you in Benijófar!